Tan Family Chronicles: My trolley load of kidzes! This picture was posted on facebook exactly a year ago - on 21st November 2010. Flash to the past! :) Comments collected, below! 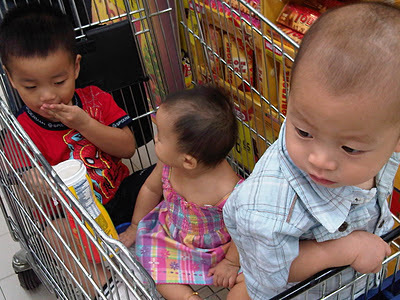 Pamela Tan : My trolly load of kidzes! Emily Loo, Cindy Quek, Jean Ang and 8 others like this. Daphne Chan where to buy where to buy?? Isaac's got a new hairstyle! It's totally DIY one. WYSIWYG (What You See Is What You Get), no refunds, no exchange allowed. The one time registration fee is minimal, delivery charges quite standard, it's the maintenance that's quite shiong. Very time consuming and can be very costly. Pamela Gordon so you had to push another trolley for your groceries? Lol! Maureen Ngam Good on you...Pamela...this is the SPIRIT OF MOTHERHOOD! Jia you!!! U look fabulous SUPER MUMMY!